Here are the photos that I was going to upload but couldn't, due to the lost cable debacle. 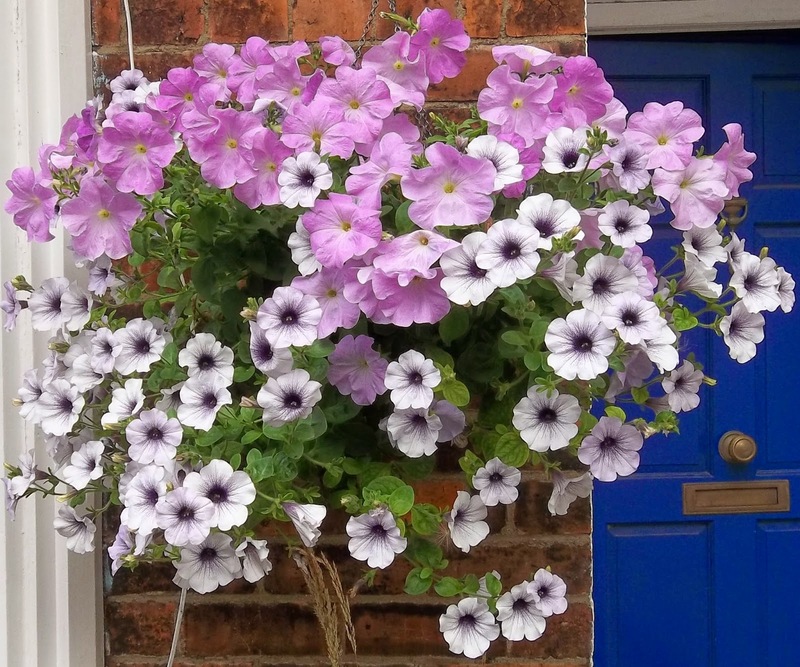 This is the hanging basket outside the front door, which cheers me up every time I see it. The plants came from B&Q and I didn't really have high hopes for them but the growth and flowering has been fantastic. 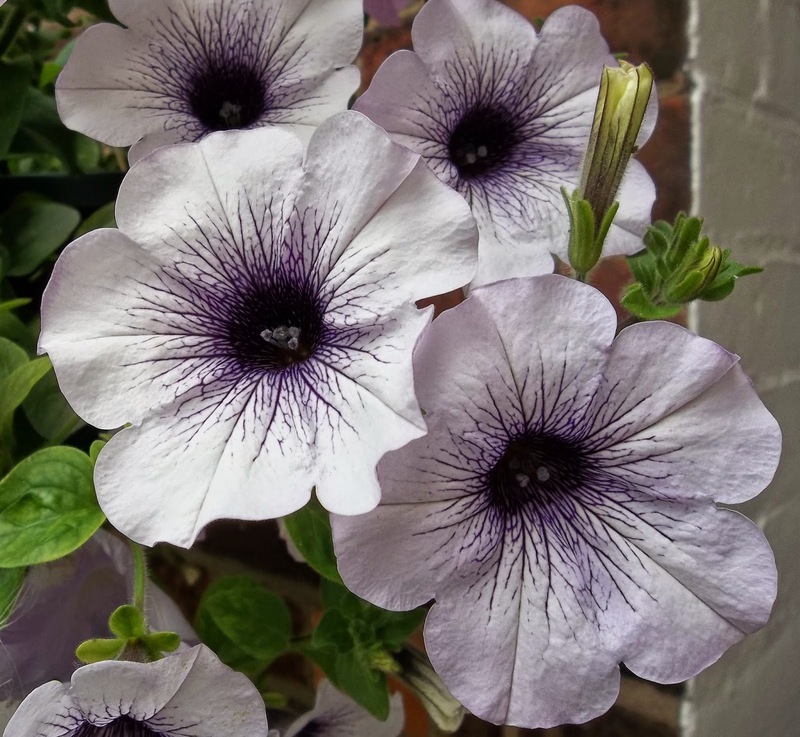 This petunia is particularly pretty and is scented too. Here is a grown from seed Nicotiana 'Lime Green' which has also put on a lot of growth. I wasn't quite sure what to expect as I haven't grown these before, but they were easy to grow and have turned into handsome plants. 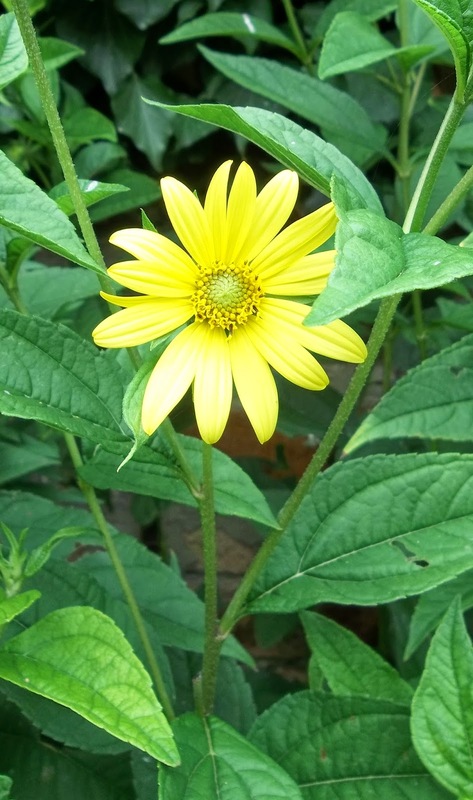 The ever cheerful Helianthus 'Lemon Queen' - the first of many photos this year, I'm sure. 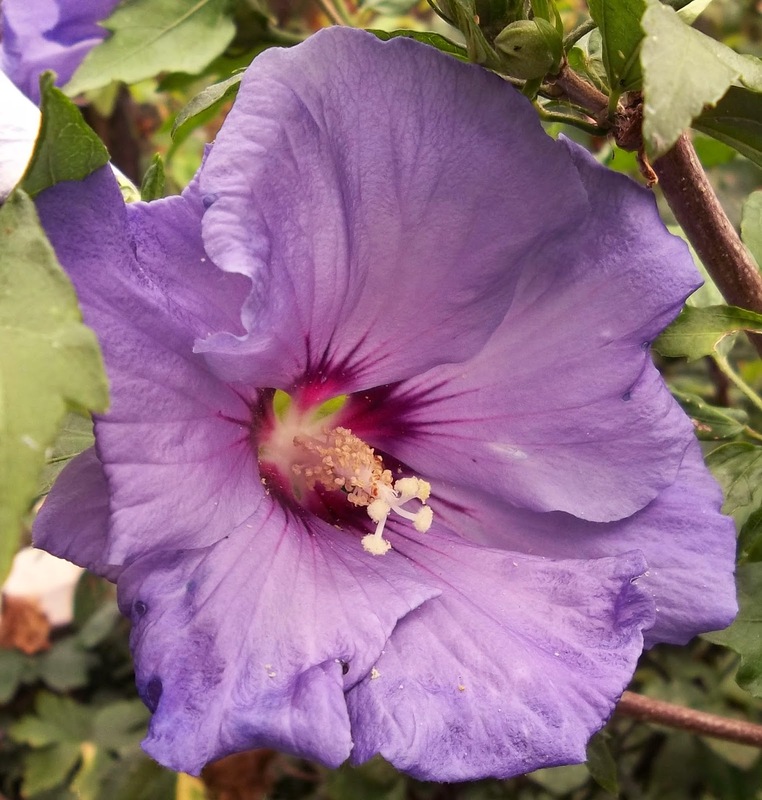 Exotic blooms of Hibiscus Syriacus 'Bluebird', another flower which features on my blog every year. Zingy orange and yellow Crocosmia, or is that Montbretia? The common one, anyway. 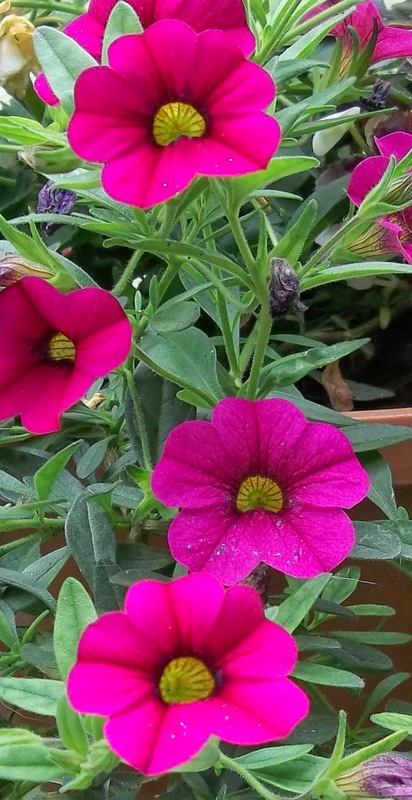 Fuchsia pink calibrachoa in the hanging baskets at the back. 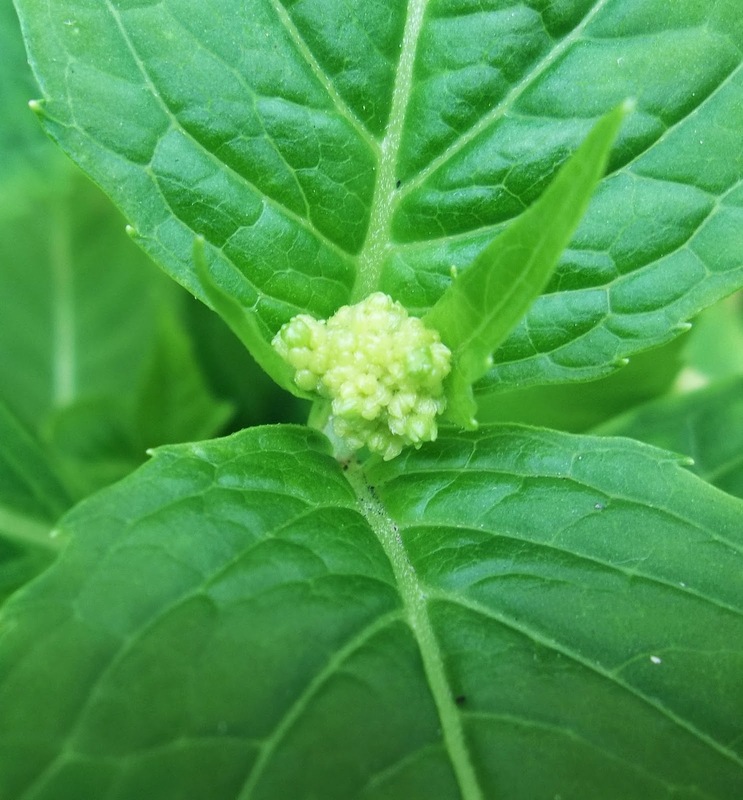 New hydrangea flowers which remind me of tiny cauliflowers. 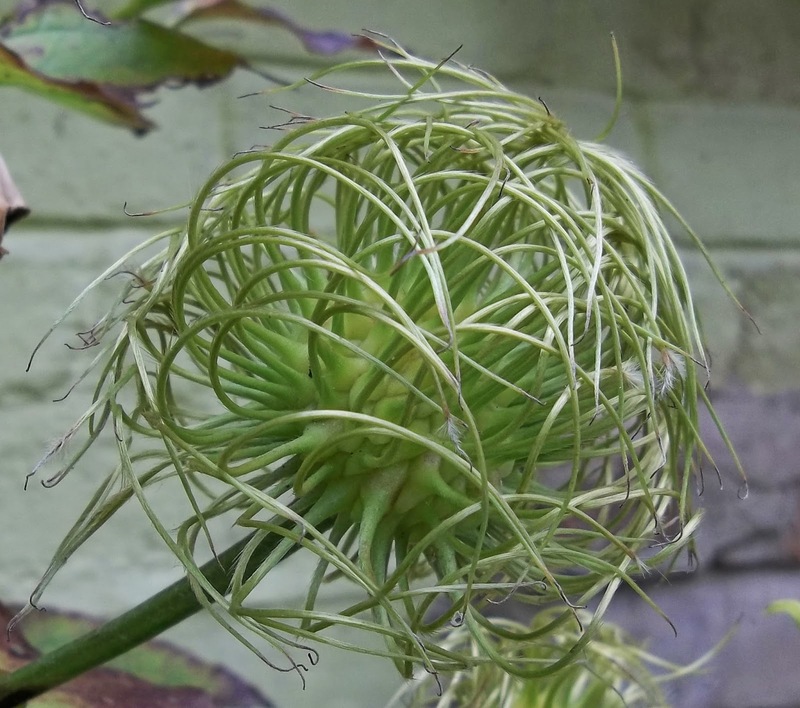 A swirly, spherical seed head from Clematis Ice Blue. The jury is out on this hydrangea - Magical Revolution - and I'm not sure it quite lives up to the hype. 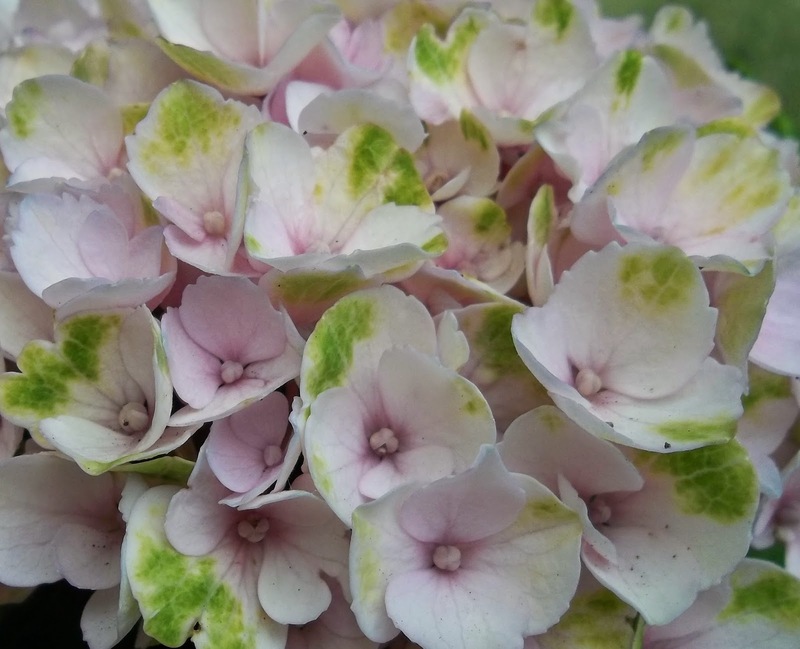 The flowers were supposed to be amazing, turning different shades of pink, cream and green. Yes, they have done that, but...I'm not sure. 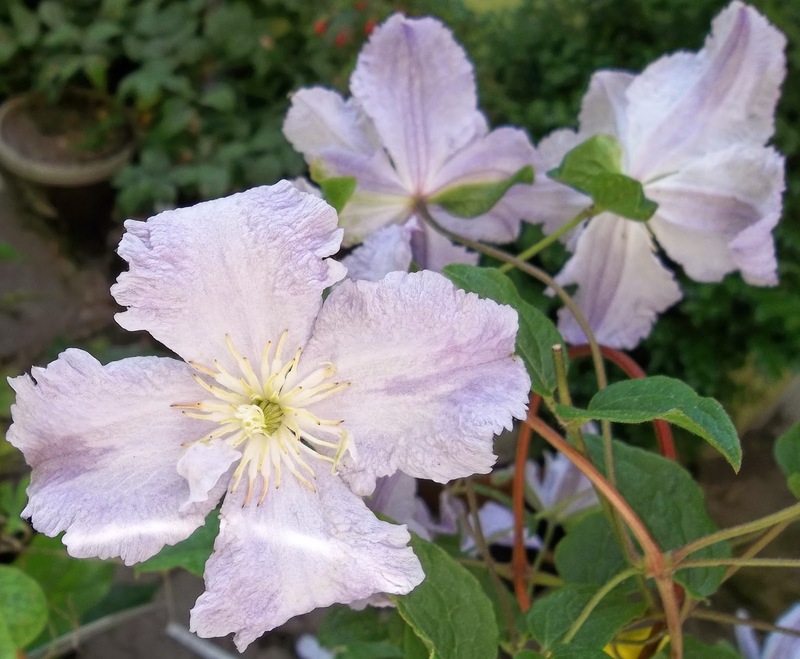 The newest member of the garden, Clematis Blue Angel. Pale lilac flowers with 'crenellated edges' according to the label. I am a sucker for clematis and have quite a few now. 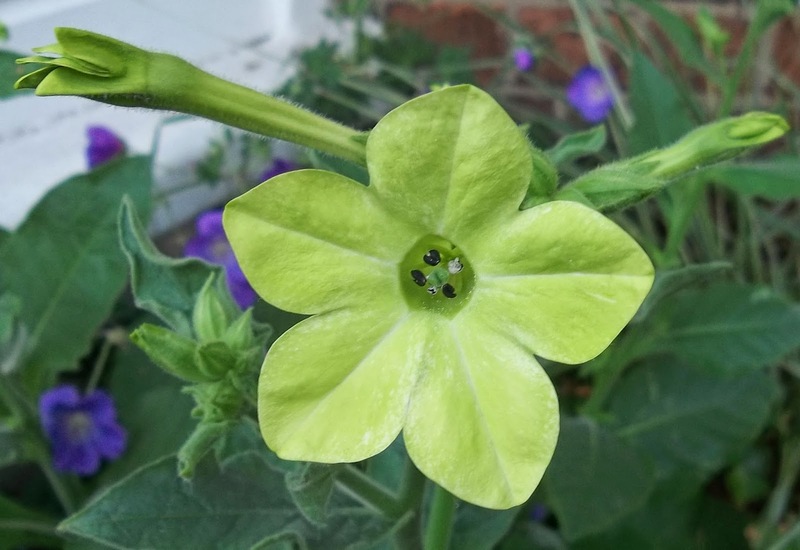 Finally, here's the Nicotiana 'Lime Green' flower, looking as lime green as the name implies and contrasting well with the purple geranium 'Rozanne' in the background. Keep going, garden, you're doing really well! And I suspect it is a Monbretia - always a cheerful splash of colour. 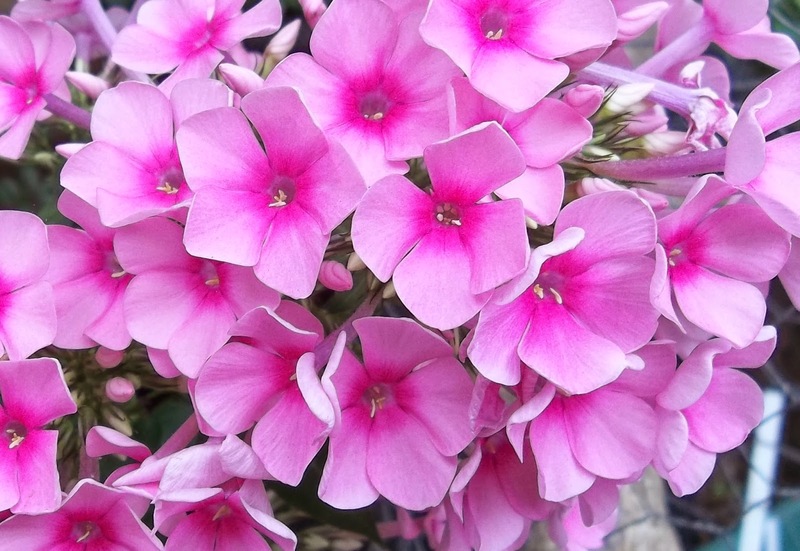 How nice to find another blogger who posts pictures of the same plant each year as they fill her with joy. Thanks, EC. My garden may be small but it is packed full of plants and I do enjoy seeing them come back each year, although I also enjoy seeing the changes each year. 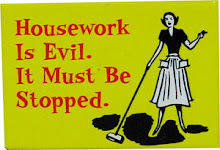 It definitely fills me with joy! It all looks gorgeous, Ellie, must try B&Q for my hanging baskets next year! 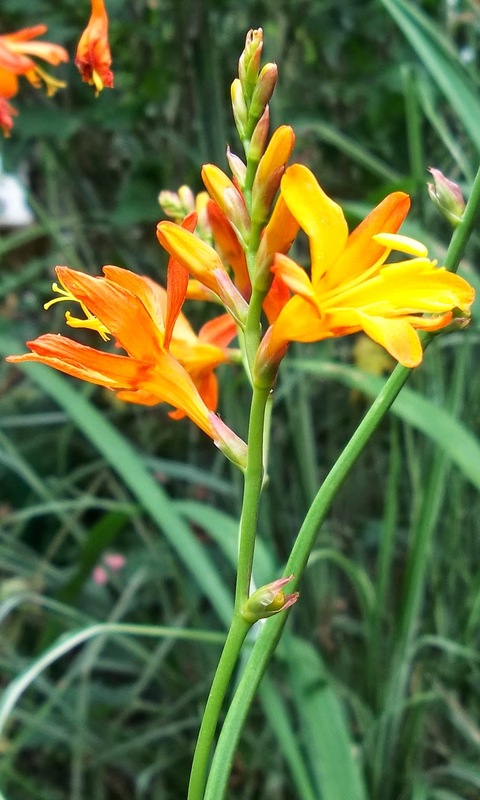 Crocosmia is the plant name, Montbretia is a variety, so I believe, it's defo one of my favourites. Thanks, Joy. The hanging basket plants were bought on a bit of a whim but have exceeded my rather low expectations, especially the one at the front. I have a couple of other crocosmias in yellow and red, but this one is the most reliable of them all. Your hanging basket is so nice and I like this combination of colors. You have quite a few clematis variety. Now we have only a few numbers of clematis. I'd like to challenge growing various clematis. Thanks, Poirot. Clematis are one of my favourite plants but some haven't done so well for me this year because, due to the mild winter, there were many more slugs and snails which enjoyed the young clematis shoots! Some of the ones which have done well are: Princess Diana, Purpurea Plena Elegans, Piilu, Perle D'Azur and Macropetala. I am sure that you have room in your lovely garden for a few more! Thanks, Joy. I haven't been much of a fan of petunias in the past, but I think these plants might have changed my mind. I am really enjoying the waft of scent from the white one with the purple veining too - a real bonus.